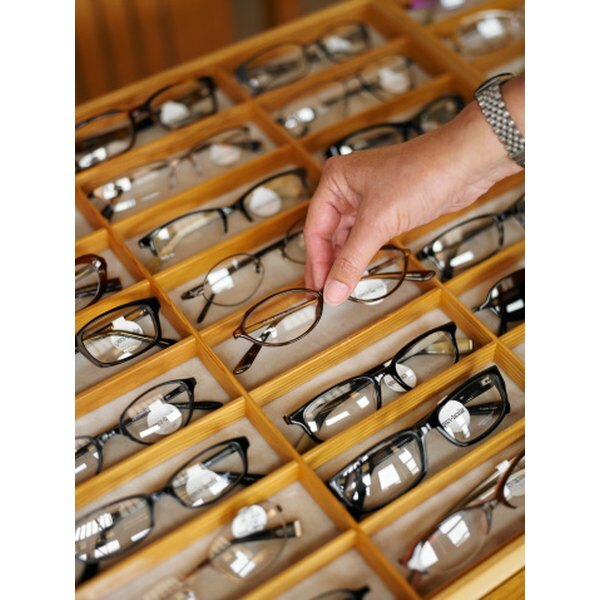 Just like many fashion accessories and clothes, eyeglasses carry a company label or designer logo. If you want people to know the brand you are wearing, the label can be a status symbol. But there might be times you don't want the logo to be obvious. You can remove a logo, but it usually leaves a small mark on the frame. If you are wearing a frame that has sample lenses, without a prescription, the logo is sometimes printed on the lens, too. You remove the logo from the frame and lenses with different processes. Cover the lenses with a small towel. Wrap the towel all the way around the lenses to protect them from damage. Open the temple, or arm of the frame. If there is a logo on each temple, do one at a time. Place the edge of an emery board or nail file on the edge of the letter or symbol you want to remove, and begin filing in very small movements, back and forth. Work on a small area at a time to prevent damaging the frame. Rub the area where the logo was with very fine sandpaper to remove any traces and smooth the surface. Sand only where the logo was located. Dust off the frame and remove the towel. Apply a thin coat of clear nail polish over the area to give it a shine that closely matches the rest of the frame. Repeat on the other temple if necessary. Wash and dry the lenses. Dip a cotton swab in denatured alcohol. Allow any excess alcohol to drip off. Apply the tip of the cotton swab to the logo on the lens, being careful to touch only the logo on the lens. Swirl the end of the swab in little circles. Repeat if necessary with new swabs until the logo is removed. Wash the lens with soapy water, rinse and dry. Removing a logo from a lens usually leaves some discoloration or a blurred area. If the logo is in a prominent place on the lens, you may not want to remove it. Some lens marks should not be removed. Safety glasses engraved on the frame and on the lens must be present to verify the lenses are made to appropriate safety standards.